Review: If you love animals and want to become a veterinary technician, your future begins at Bel-Rea Institute. 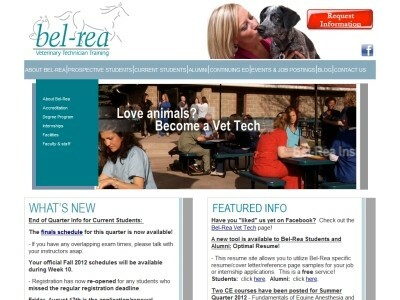 Located in beautiful Denver, Colorado, the Bel-Rea Institute of Animal Technology is one of the largest veterinary technician schools in the U.S. that offers an Associate of Applied Science Degree in Veterinary Technology. Highlights of the program include hands-on training and experience in the classroom, labs, and during your 10-week internship, and advanced training facilities, such as fully-equipped surgery and treatment rooms, and on-site small and large animal facilities. Location & access map for "Bel-Rea Institute of Animal Technology"